Just like restoring an old car, taking on a repair project of a classically constructed piece of furniture can be a real learning experience. Although I generally shy away from repair work you may recall the work I blogged about restoring a set of Selig chairs and ottoman. Here’s a link to the first BLOG about them which will link you to their completion. Selig chairs are collectable items due to their Danish style and construction. My Selig chair client referred a friend to me hoping that I could do something with their Teak chairs — they’re about 50-60 years old but unlike the furniture we find in stores today well worth the effort to keep them. This is the hope I have for my furniture work, that wherever it may end up in 50-60 years someone will see the value of it rather than placing it out on the curb for pickup! I don’t mean to get long winded but whenever I get into furniture construction it reinforces my thoughts regarding dowel joinery. I recall (in the 60’s) my high school woodshop teacher, Ben Aiello discussing them. This was a very common way to construct all types of furniture but when you add a secondary material the wood reaction to seasonal and structural changes will usually cause that joint to fail! Over the years I’ve seen that time and time again and why I use traditional mortise and tenon joinery in my work. Dowels have been supplemented with biscuits, pocket hole joinery, and now the very expensive Festool Domino system which may be stronger than the dowels but; in my traditional mindset, nothing will replace the time consuming method of mortise and tenon joinery for framework. Okay — off of my soapbox now, I know that adage about time being money and that’s what most are concerned with. Seat support, broken dowels and unfinished surface. I’m hoping that when everything is put back together it will relieve the stress at this point. 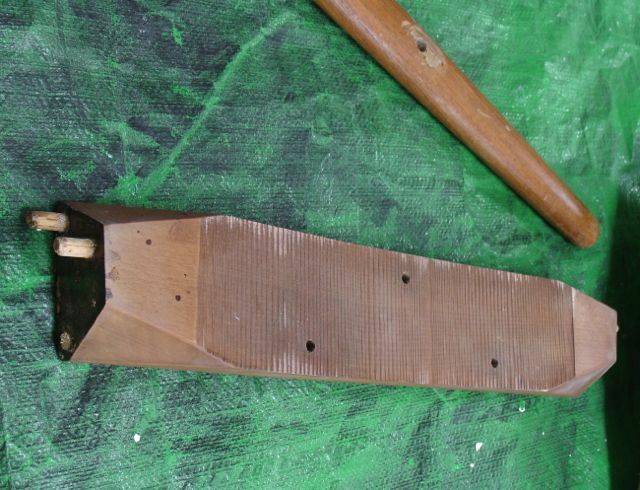 The main damage occurred on the main stretcher that connected the sides and supports the seat cushion. These are 3/8″ dowels and someone before me has attempted a repair with some sort of adhesive. One thing that surprised me was that the underside of this stretcher had a surface right off of the bandsaw with no attempts made to smooth it out. As I continued to disassemble the chair it became apparent that many of the dowel holes have become oval due to the hardness of the dowel compressing the relatively softer, end grain of the wood as people sat and moved around in the chair. Replacing the dowels with larger diameter ones isn’t an option since some stayed in one side of the joint but loosened from the other! I recall a trick from way back, working at Silvera Lumber as a teen and young adult — I’ll wrap the exposed end of the dowels with cotton thread prior to glue up. Another method would be similar to a fox wedged tenon but that’s too risky on a small diameter dowel such as this. The cotton thread should absorb the glue and effectively increase the diameter to where it’ll fill the hole tightly. Speaking of glue, I was hoping that the chair was assembled with hide glue and that seems to be the case. Vinegar and warm water has removed most of the residue so that, hopefully, things will join back together once the joint has been cleaned. Dowels that were broken were first removed or cut off flush. The stretcher joinery is coped to join to the legs but the only real strength here comes from the dowels. The previous repair had lots of glue here but gluing the end grain of the stretcher to the face grain of the legs doesn’t provide any strength at all. These joints were cleaned being careful not to change the profile of the cope. Once these were as clean as possible I used a round brush along with the water/vinegar solution to remove as much of the old glue as possible. The main stretcher presented another problem. None of these dowels survived so after cutting them flush the holes needed to be re-drilled. I would have preferred using a drill press but as you can see, there isn’t a square surface to reference to. After cleaning the first challenge was finding the center of the hole. Here’s how I solved that dilemma with a circle template. I “eyeballed” a 3/8″ hole then used a straight edge to extend the lines. After center punching, a set up block was used to help me keep the hole as square as I could. I’m left now with about a dozen dowel joints that needed to be assembled and clamped at one time! Add to that the shape of their stylized chair, meaning no square corners to clamp up; and I’m in for a stressful morning. Diane had some cotton thread (polyester wouldn’t absorb the glue) and as with all glue ups it’s a one shot deal. Thankfully we have some cool weather right now and with a successful dry fit and the use of liquid hide glue I’m keeping my fingers crossed. If all goes well the next post about this project will show a chair restored to its former glory! This entry was posted in Uncategorized and tagged chair restoration, Danish modern furniture, liquid hide glue, Selig Chair, Silvera Lumber. Bookmark the permalink. 2 Responses to Chair Repair and the Things I’m Learning! What about Spanish windlass? You have to protect the wood otherwise the thread will dent it. Thanks to your comment and a bit of internet research I now know what a Spanish Windlass is! Seems like a good alternative to clamping — I’ll keep it in mind.